Madrid: Antoine Griezmann scored one and set up another but could not prevent Atletico Madrid tumbling out of the Copa del Rey on Wednesday as Girona progressed on away goals after a thrilling 3-3 draw. Defeat for Real, however, means Santiago Solari’s team have now won only two of their five matches this year. But Girona pulled out one more surprise to go through to the quarter-finals as Seydou Doumbia’s shot found the corner in the 88th minute, snatching a 4-4 draw on aggregate after last week’s first leg finished 1-1. The Frenchman, however, had started as a substitute while Atletico were punished for some uncharacteristically lacklustre defending. A sumptuous volley from Valery Fernandez and Cristhian Stuani’s header had put Girona in charge after Nikola Kalinic had given Atletico an early lead. Perhaps Simeone had one eye on the Champions League tie against Juventus next month, not to mention his side’s title challenge, which sees them five points behind Barcelona and the Catalans’ closest challengers in La Liga. 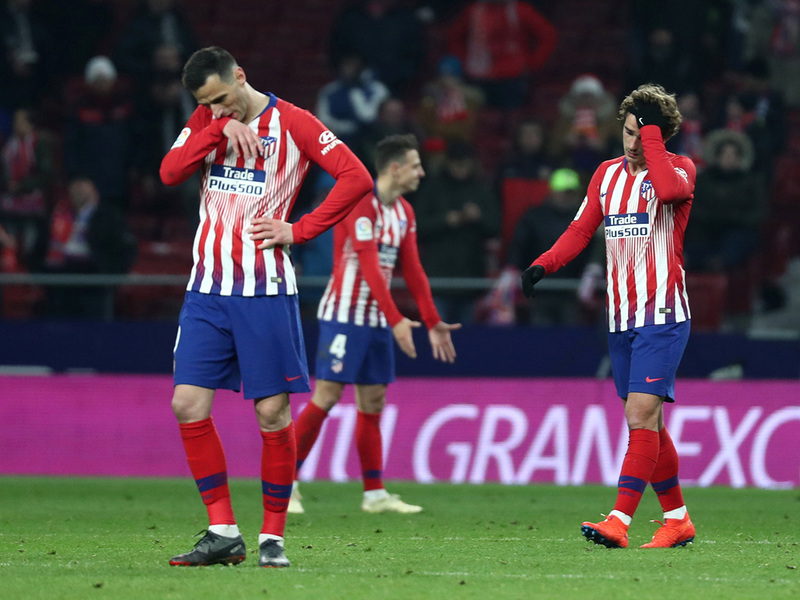 But it is now six seasons since Atletico last reached the final of Spain’s most prestigious cup competition, which still represented their most likely source of a trophy this term. They had looked set for a comfortable night when Kalinic was allowed to drift in behind Girona’s dozing defence in the 12th minute, let the ball bounce and drive in on the half-volley. Girona pulled ahead. Atletico were uncharacteristically generous in giving Stuani space at a free-kick and he nodded in Aleix Garcia’s cross with ease. The ball had hit the net in the 59th minute and in the 61st, Griezmann entered the field. In the 65th, he set up a goal too, Kalinic letting the Frenchman’s pass run but doing enough to distract Girona’s defence. Correa nipped in and finished. With Girona still progressing on away goals, Atletico had just over 20 minutes to find a winner. Santiago Arias thought he had it but VAR showed him just offside. So did Griezmann, as he latched onto Thomas Lemar’s scoped ball through and smashed it into the roof of the net. They now turn their attention to Saturday’s crunch La Liga game against Sevilla, who slipped to a 1-0 defeat at home to Bilbao. Gorka Guruzeta scored the winner for a rejuvenated Bilbao side but Sevilla still progress 3-2 on aggregate.